Mountain bikers who have enjoyed riding at the Carlsbad Highlands Ecological Reserve for decades are shocked to learn they have been doing so illegally. 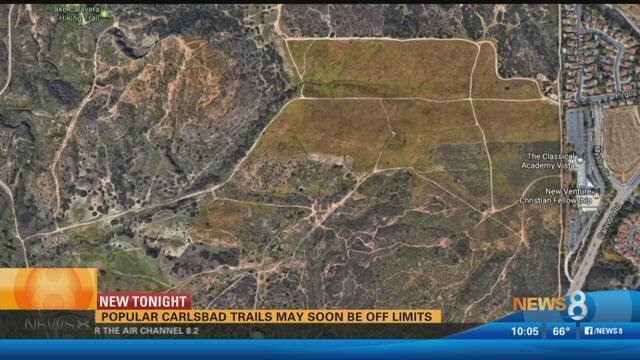 SAN DIEGO (NEWS 8) - Mountain bikers who have enjoyed riding at the Carlsbad Highlands Ecological Reserve for decades are shocked to learn they have been doing so illegally. Mountain biker Rick Minnick, along with other mountain bikers, had no idea the trails on the California Department of Fish and Wildlife (CDFW) side was illegal until 'closed trail' signs starting going up. In 2000, CDFW bought 473 acres, the city of Carlsbad owns 110, and state law does not allow bikes on ecological reserves. "That was news to me and the whole group of people we ride with. There are no wardens out there ticketing - no type of enforcement along those lines," said Richard Burg, CDFW Environmental Program Manager, Region 5- South Coast. To allow bikes would require a change in code by the legislature or California Fish and Game Commission. "We have been working with San Diego Mountain Biking Association Carlsbad Highlands to see if there is something that we can work together with and opening up trails for biking," said Burg. A satellite view of the area shows the man made trails, but there are only two legal hiking trails on state land. Allowing bikes may not happen soon, but cyclists are hopeful. "We are respectful stewards of the land," said Minnick. "I support a balanced approach that allows people to enjoy the benefits of open spaces such as the Carlsbad Highlands Ecological Reserve. It is my hope that outdoor enthusiasts and the California Department of Fish and Wildlife can come to a consensus that ensures safe access for people and protects the natural environment." The San Diego Mountain Biking Association says it plans to have another meeting with the state next week.